Tampa's Famous Columbia Restaurant's Filet Salteado! The Daily Nest: Tampa's Famous Columbia Restaurant's Filet Salteado! Tampa's Famous Columbia Restaurant's Filet Salteado! 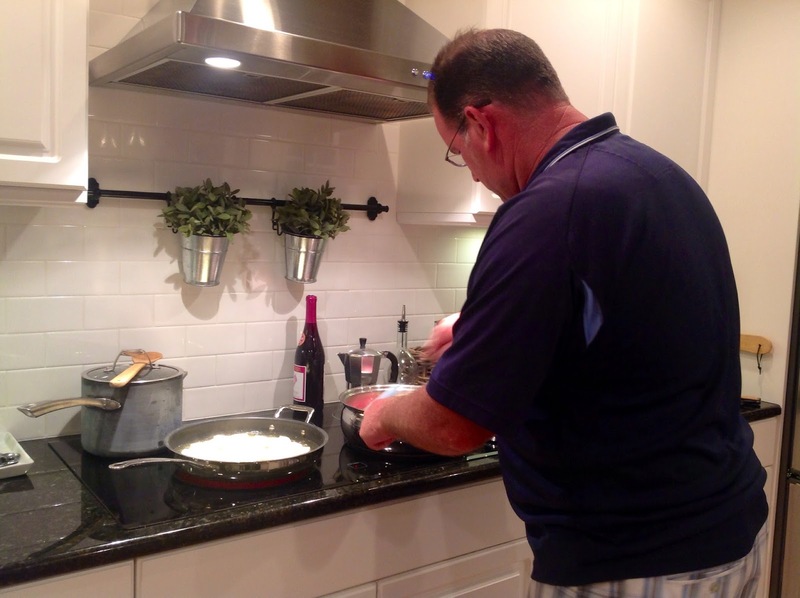 Today I'm sharing with you a recipe that my husband has been making for quite a while now for his guys at the fire station. If you've ever visited Tampa, hopefully you've eaten at the Columbia Restaurant. It's definitely one of Tampa's most familiar landmarks, for it's Florida's oldest restaurant, founded in 1905. The food is not only delicious, but the restaurant feels like you've stepped back in time. With it's hand painted-tiles and custom made wrought iron chandeliers that give it an Old World Charm. This is what Mike orders every time we visit the restaurant, and so he started making it. I thought I would share it with you! 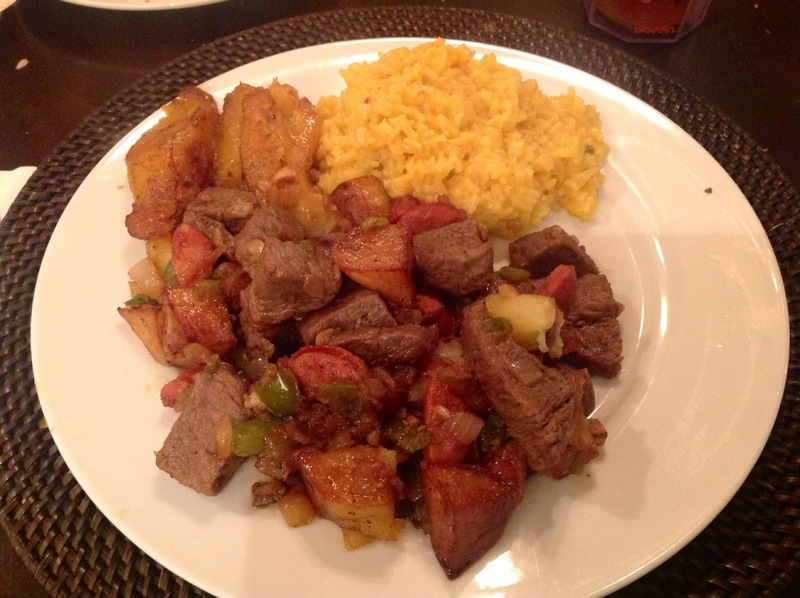 Filet Salteado is a delicious sauté of tender filet, potatoes, onion, green pepper, chorizo sausage, garlic all perfectly combined with red wine and served with yellow rice. Recipe is at the end of the post. All the ingredients chopped and ready to go into the hot oil. 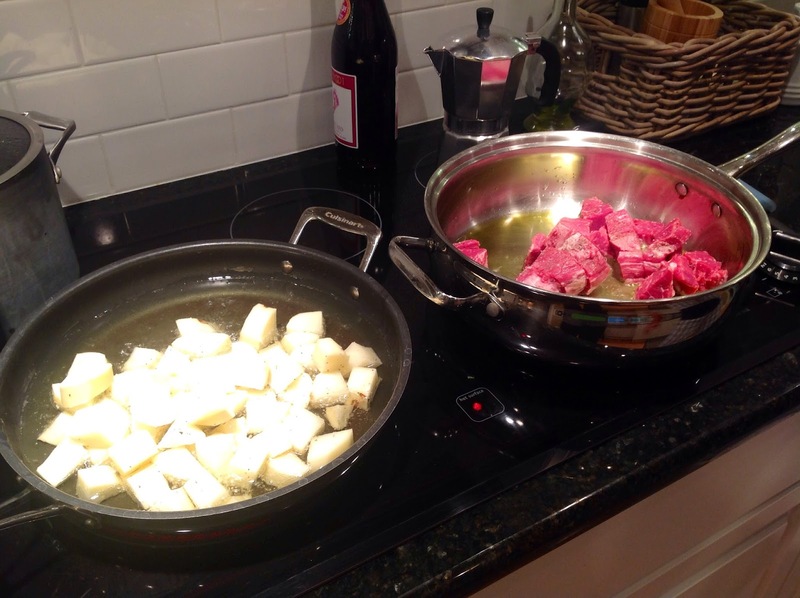 Potatoes and Filet sautéing. One thing he omits is the mushrooms. He's not a fan! Here's Mike hard at work, Gotta love him! As the recipes states it can also be prepared with chicken, pork or shrimp! Might have to try that! We also serve them with Plantains, there at the top left of the picture. Sauté diced tenderloin in hot olive oil. 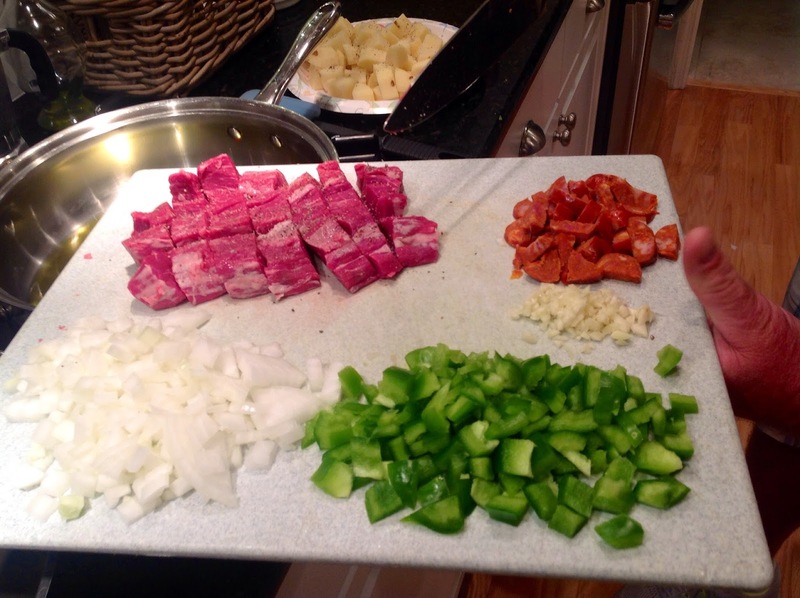 When meat is brown, add chopped garlic, onion, and green pepper. Set aside. 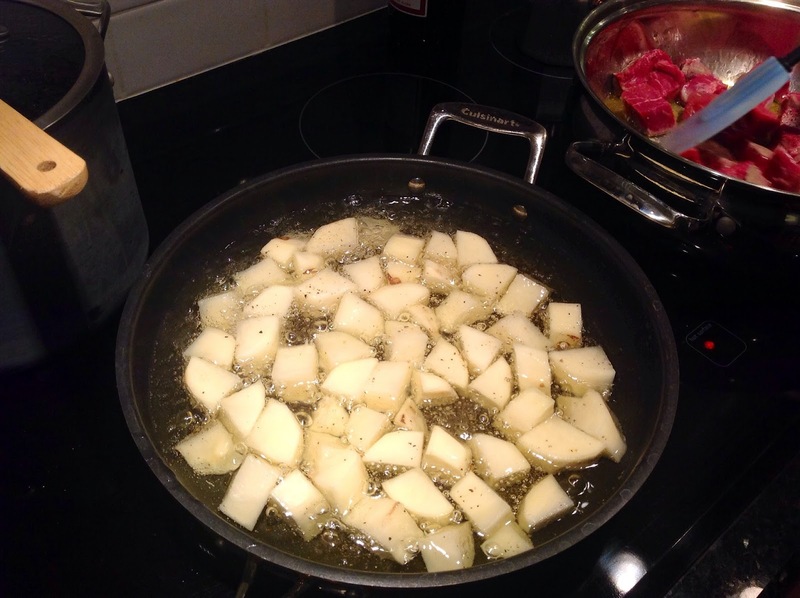 Deep-fry diced potatoes in vegetable oil for 10 minutes or until brown; drain on paper towels. Add chorizo, mushrooms, salt, pepper and potatoes to the meat. Add wine and bring to a boil. Serves 2. * May substitute chicken, pork or shrimp for filet. I would love to hear your reviews!! On another note, I hope you're enjoying the new blog design! The commenting system is still processing but should be up and running by tonight! Fingers crossed! If you're a blogger I would love to hear what commenting system you're using. So drop me a line!